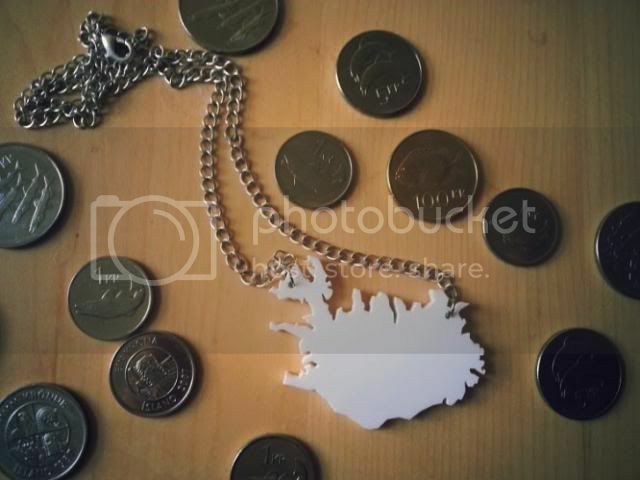 Christina Berrangé » Blog Archive » Iceland around my neck. Our story begins a month ago. It is no secret that I love Iceland, a lot. It was Daniel’s and my last day in Reykjavik and we decided to tour the National Museum of Iceland (highly recommended, by the way!). I walked past the gift shop thinking I’ve already spent too much money and I’m not going in there. Then in the display window I saw this necklace. I stopped instantly and went into the shop to look at it. I couldn’t justify spending more money on an impulse purchase, but I took a photo of the designer’s business card, just in case I still wanted the necklace a week later. Guess what? I did. A week later Daniel and I found ourselves in Keflavik airport, on our way back from the States. I was all prepared to run to the gift shop in the main terminal to a get a cheaper, not-as-nice similar necklace that I saw before flying to the States. However, our layover was so short we only were able to get some skyr at a cafe before we were London-bound. Considering it is currently 25 degrees C in London at the moment, I should probably be wearing something more summer-y…but I don’t care. I love this necklace. Thank you Lena! If you’d like a necklace, visit the gift shop at the National Museum of Iceland, or email Lena lena245 at gmail dot com. She makes this necklace in various colours and they’re all really nice. 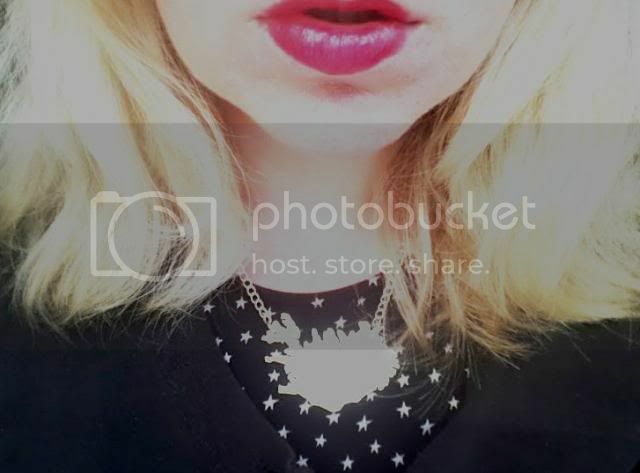 I love the photograph of your red lips, the necklace and the black and white dress. Very cool!